Bill and I are planning our annual trip to Maine, which is always a journey in every sense of the word — we always drive, and use it as an excuse to see parts of the country (or friends, or family, or anything) we wouldn’t otherwise be able to visit. We try to combine elaborate schedules with enough free time for discoveries. This year will be a spectacular jaunt, because we will be celebrating his 60th birthday on the way. Months of ‘net-crawling, calendar-consulting and financial figuring are finally falling into place to create Bill’s dream blow-out, a sort of nerd bacchanalia: The day before (b-day minus one), we’ll be in New York City, watching the new Metropolitan Opera staging of Die Walküre, a five-hour installment of Wagner’s “Ring of the Niebelung” cycle. Dinner that night will be at one of our old-school French favorites, La Grenouille. On the big day, we’ll hear one of my jazz-fiend husband’s favorite performers, Al Jarreau, at the Blue Note at 10:30. These three events alone check off a large portion of Bill’s bucket list. But where to dine before the show? Arranging his birthday dinner took the kind of dedication and coordination required of a true foodie acolyte — which, fortunately, I am. 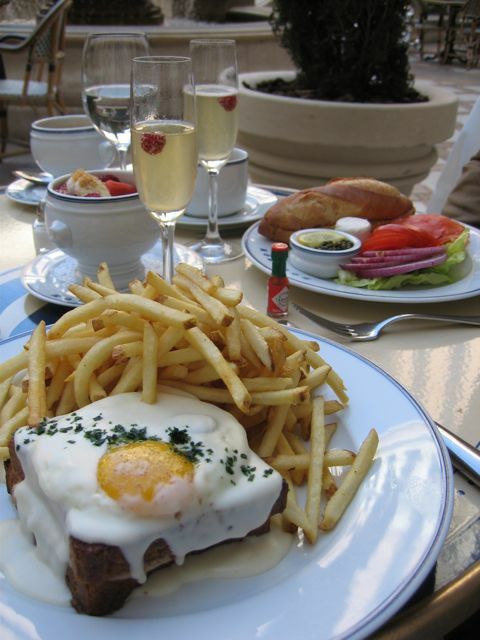 Brunch at Bouchon, Las Vegas. We spent hours researching and discussing what kind of culinary analgesic could take the sting out of knowing you’ve actually hit 60. Like me, Bill loves high-end, food-as-art, chef-driven restaurants, and is willing to pay as long as the experience is worth it. We loved Daniel in NYC and Alain Ducasse in Paris, but we wanted to try something new. Bill is a sushi hound, but we’ve already been to Nobu and Morimoto in other towns. We narrowed it down to a select few, including Masa, Adour and Bouley, before finally zeroing in on our first choice: Per Se. Per Se’s Thomas Keller currently enjoys the reputation of being America’s top chef master, and he doesn’t have to face Tom Colicchio to prove it. We visited one of Keller’s restaurants, Bouchon, for a stellar late brunch in Las Vegas, and even though the food there is relatively prosaic brasserie fare, the meal and relaxed environment remains as distinctly memorable to us as a vivid desert mirage. I long ago declared his Napa Valley, California, restaurant, the French Laundry, as the place I’d most like to limp through my own 60th spin around the sun, a few years from now. Although Keller’s New York restaurant, Per Se, does not quite garner the reviews of the French Laundry, it’s still among the top recommendations for most serious critics. We loved the sound of the chef’s tasting, a progression of small, extraordinary tastes in Keller’s distinctive style: clean, beautiful American seasonal ingredients, often proffered with a Japanese devotion to simplicity and a classic French twist (and I don’t mean the hair braid). His signature dish is “oysters and pearls”: a translucent raw oyster with caviar “pearls” and tapioca “sabayon” (a kind of rich, eggy foam). The prices at both restaurants — close to $300 per person for the full chef’s tasting, including service but not wine — do nothing to abate the throng of eager diners. Getting a reservation at Per Se is famously difficult and tricky (unless, apparently, you posses an American Express black card). As at a select few other restaurants, reservations are taken exactly one month in advance, and phone lines open precisely at 10 AM. If you wait more than two minutes, you’ll get an impenetrable busy signal. More than 30 minutes on hold also spells doom. We’ve had our hearts broken before with this kind of system [silently shakes fist at José Andrés’ Minibar in Washington, DC], so I knew we couldn’t count on getting in. Yes, and I do mean at any time — more than likely, even with the best of luck, as a party of two, rather than four or more, we’d be offered only very late or very early slots. Still, I was hopeful. Perhaps it was a sign of the economic times that Per Se had recently shortened its advance for reservations from two months to one. Also, I’d experimented on Open Table to see if reservations ever turned up at the last minute — and indeed they do, although with no rhyme or reason except that snowstorms accompanied a better chance of openings. So I knew we might still happen to get in even if this first effort failed. But “happening to get in” isn’t what you want to have to rely on for your beloved’s 60th birthday. On the 30-day advance date, I set an iPhone alarm to remind me. As the 10 AM witching hour approached, I dialed the number in advance, set it to speaker, and watched my Atomic Clock app tick away the miliseconds, finger poised over “redial.” I pounced on it as soon as the digits flicked to 10. First sign of hope: Not a busy signal, not an announcement that the restaurant’s reservation desk was closed, but a recording directing me to hold on for reservations. The on-hold recording offered up information about a dress code, an elevator and other tantalizing insider tips. But as I heard the second, then third, then fourth loop of that maddeningly cheerful voice, my little hope balloon developed a slow leak, deflating ever so steadily as the wait stretched on. Just short of 30 minutes on hold, even after I’d tired of mockingly chanting the loop along with Rita Restaurant-Info, I began to wonder whether I should just hang up. Then someone picked up. And spoke to me. And listened when I asked about reservations on the magic day. And offered me two seatings: 5:30 and 9:45. Maybe this doesn’t sound like a triumph to you, but I was ready to tap-dance. An early seating would allow us to get to the show later, and it would likely be the only time we’d eat that day, except maybe for some little nibbles of toast and coffee after sleeping in late. We could easily count on staying three hours. I gleefully gave our credit card number for the 5:30 spot, and acknowledged that a cancellation without more than three days’ notice would cost us dearly. I debated whether to surprise Bill with the good news after we arrived in New York, but in the end, I printed out our emailed confirmation, tucked it into a birthday card and set it out for my husband that same day. “Your birthday celebration has begun,” I told him. He was as overjoyed as I about our luck, and like me, he set off on a fit of Googling about Per Se’s menu, reviews and photos. We will spend the next month salivating. 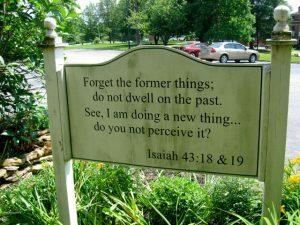 Sign near a learning center named for my grandfather, Nathan Reese, on the former Sue Bennett College campus, London, Ky. This trip is something we look forward to every year, and we usually start planning the next one … well, even as we’re traveling, thinking about what we might like to do differently next time. The anticipation is nearly as much fun as the experience itself, but not as wonderful as looking back, knowing that in the context of your entire life, only a few moments stand out clearly. Just as it had for that Las Vegas brunch, time becomes an editor and magnifying glass, helping you lose unimportant details, and focus on what counts. Of course, time works the same way for much more important things, such as friendship, marriage, what kind of contribution you’re making to the world. In the large scheme of things, restaurants don’t matter very much. But we do love them, and I’ve been fortunate enough to evaluate them professionally for years. Looking back helps us sort out which stay with us, and why. Looking forward to Per Se, we begin to wonder how it will compare to some of the amazing restaurants we’ve enjoyed since we’ve been together these seven years, including our previous six Maine trips. Some coveted reservations, like those for Per Se, required careful, long-term planning. 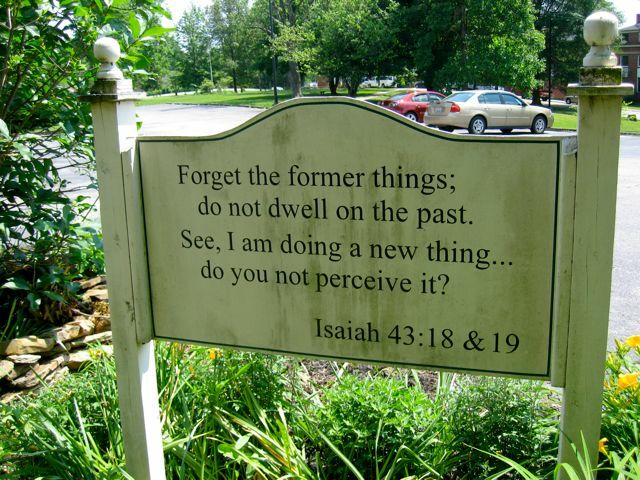 Others we stumbled upon, unknowing. Some disappointed, despite critical raves. Others simply blew us away as underappreciated gems. Like what? Glad you asked. Looking back as we look forward, only a few restaurants stand out as …. well, I’ll say it: Life-changing. They’re the kinds of places that pivot you on your heel, redirecting your understanding of food, of life, of creativity and what it means to eat and live well. Bill, with Maggie Thatcher, at Rules in London. Crab salad, with sea urchin, at Rules. Some are well-known, like the aforementioned Daniel and Alain Ducasse. These French masters gave us our first taste of truly important, world-class cuisine. The former Seeger’s in Atlanta must also be acknowledged. The Inn at Little Washington, where Patrick O’Connell forged his singular, self-taught cuisine, and created an empire. Philadelphia’s Le Bec Fin, where the chef himself gave us an understanding of his philosophical approach, which has allowed his restaurant to thrive. Le Bernardin, where we celebrated our hours-old marriage. Arbutus, in London, with its cheerfully socialist approach to keeping costs down for its incredible fare. 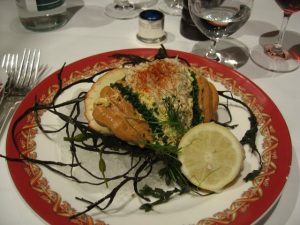 Its opposite, which we enjoyed equally, was the gleefully Tory-ish hangout The Rules, London’s oldest restaurant, with breathtakingly fresh and contemporary versions of old-fashioned dishes, much of it from its sister estate in the High Pennines. 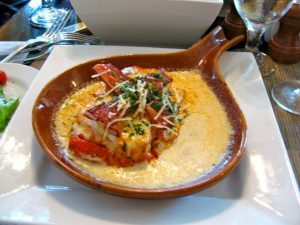 Two places, however, stand out even more distinctly for their fearlessly creative approach, a kind of stunning audacity that had you constantly asking, “How did they do this?” even as you swooned over the pure deliciousness of every mouthful. 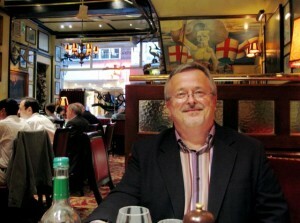 It’s certainly enough for Bill and me to have good food, creative fare and decent service, but for us, taste is king. Bill particularly enjoys the kind of devoted old-world service you often find in great European restaurants and well-aged American steakhouses. But overall, we don’t care how beautiful the food or the room looks, or how good the service is — if the food isn’t great, we won’t be back. These two particular spots, however, achieved extraordinary flavors with strikingly unusual combinations, and presentations that looked more like abstract paintings — or sculptures — than dinner plates. 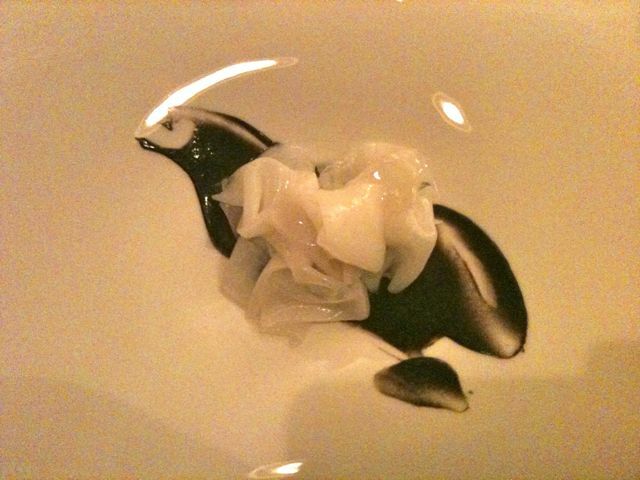 Cuttlefish, on squid ink, at Town House. The aftermath of Bill's cuttlefish. He liked it. The first is a tiny restaurant in a tiny burg: Town House, in Chilhowie, Va. A few weeks ago marked our fourth visit since deciding to stop in on our way home from Maine several years ago. We read about it in a front-page story in the New York Times, and decided we had to visit the place where a daring restaurant owner advertised for chefs on Craigs List, offering carte blanche to create the restaurant of their dreams. The result is this incredible spot driven by married chefs John and Karen Shields and eerily prescient sommelier Charlie Berg, and behind a not-especially-well-appointed dining room, a kitchen full of state-of-the-art equipment. The chefs work not only to challenge their diners’ attitudes about food, but to reflect the attitude and beauty of their environment, in the shadow of the Blue Ridge mountains. One of Karen Shields’ desserts stands out starkly: a dessert of chocolate crumbs, mounded and peaked like the valleys and purple ridges around us, decorated with edible wild flowers and other handmade mountain flavors, like sorghum and caramel. The second place was perhaps even more remarkable because the unlikeliness of the surroundings. That year, we decided to begin our trip to Maine by visiting some branches of my family tree, traveling from Tennessee to Kentucky, where my parents were born, and on to Indiana to see my brother, niece and great-nephews and -niece. After our eye-opening tour along narrow, harrowing roads into the impoverished Laurel County, Ky., hollers where my folks had grown up, we saw my grandparents’ windblown, remote mountaintop gravesites. Traveling on via Daniel Boone’s trail, past Berea and the Boone Tavern, we made it into Louisville. I had already begun to think of this leg of our trip as the Ghost Tour, even before we stopped for lunch at the legendary Brown Hotel. We dug into their signature Southern invention, the hot brown sandwich, a desperate chef’s ploy to feed a crowd of hungry dancers when he ran out of ham and eggs in the wee hours of a morning in 1923. Hot brown sandwich, at the Brown Hotel, Louisville. Red Hill Cemetery, Laurel County, Ky.
Seelbach Ballroom, site of the Gatsby wedding. The Seelbach's Rookwood pottery-lined Rathskellar. Chef Bobby Benjamin, at the Oakroom. 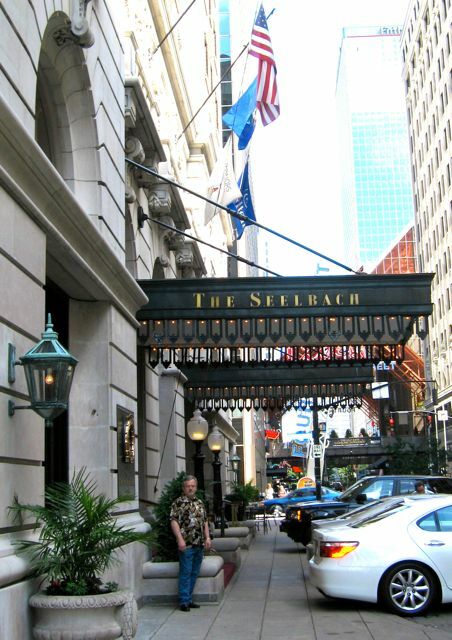 I wanted to stay somewhere else: The Seelbach, another grand old historic Louisville hotel, where for decades thousands of flappers, zoot suiters and Derby partiers crowded into its ornate marble lobby. Like the Brown Hotel, it reopened after a long closure, and still struggles to attract a small slice of the clientele who once made this spot so mythical. Some of the ghosts here are family — we sipped bourbon in the bar, where my dad celebrated while on leave from nearby Fort Knox before shipping off to the Philippines in WWII. 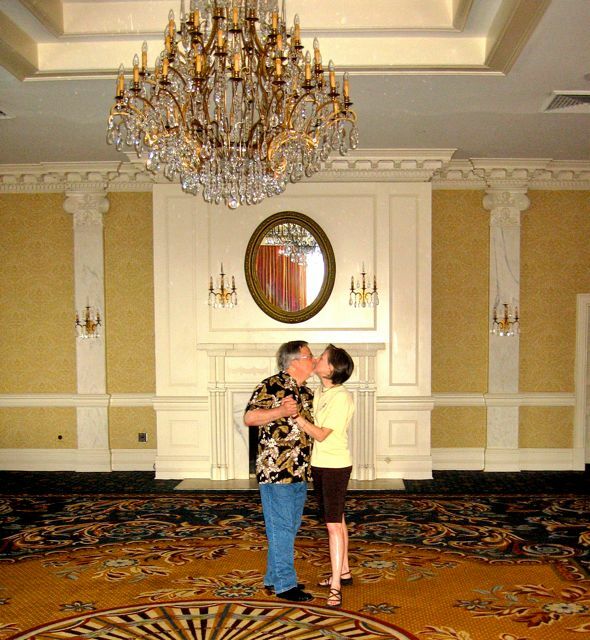 Some are fictional — we danced in the beautiful, deserted ballroom, where F. Scott Fitzgerald had set the wedding of The Great Gatsby‘s Tom and Daisy Buchanan. Another is legendary — The Lady in Blue is said to be spotted near the elevator in which she plunged to her death. Others are simply imaginary — the gorgeous Rookwood pottery-lined basement which once housed a lively Rathskellar, another likely haunt of my dad and his WWII buddies, is today empty and eerie. 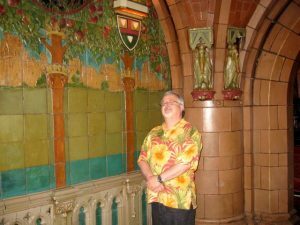 I took a peek back at the Lady in Blue’s elevator as we were escorted into the Seelbach’s Oakroom for our dinner reservations late that night. Only one other couple were seated in an enormous, hand-carved dining room entirely crafted of oak. They soon left, the Dockers-clad husband clapping a cellphone to his ear on the way out, his wife’s flip-flops echoing behind him. We nervously eyed the cavernous space, now feeling embarrassingly overdressed. 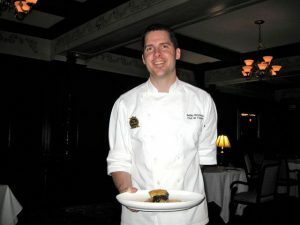 The Oakroom has earned an impressive number of dining accolades, but we’ve experienced sudden reversals many times before. An empty room is never a good sign. All those ghosts seemed to hover in the dark corners, laughing at us. 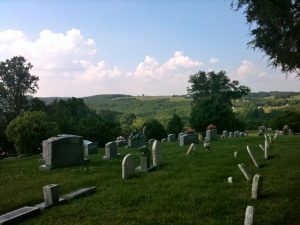 My family ghosts — self-sufficient, no-nonsense Appalachian Baptists who scraped a living from the rocky, wind-blown knolls we’d just visited — were probably doubled over. 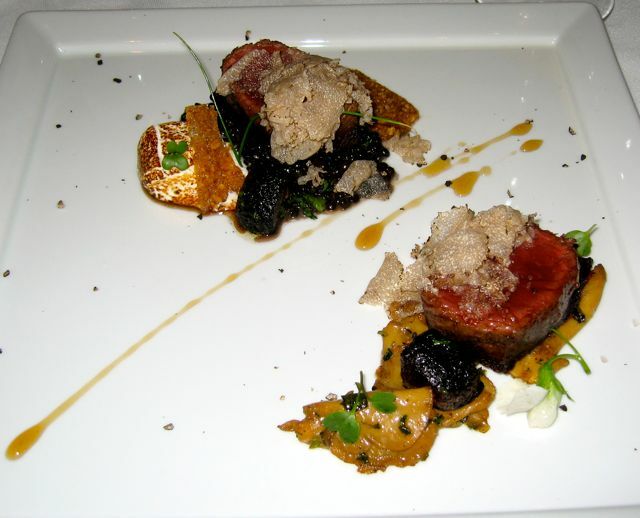 Beef with black truffles and toasted marshmallow, the Oakroom, Seelbach Hotel, Louisville. The dinner we embarked upon was shocking in its daring, even more so considering the lack of diners. (A private room held a group of diners that had jetted in from Nashville — without benefit of a glimpse or clue, we decided they must be Tim McGraw and Faith Hill with some friends.) We still talk about the dish that turned us on our heads, the one I’d ordered on a dare: filet of beef with truffles and toasted marshmallow. I know, I know — that sounds crazy. And horrible. That is what made it even more magnificent — the meltingly tender beef, amplified by a rich brown sauce, with just a touch of caramelized sweetness from the house-made marshmallow. 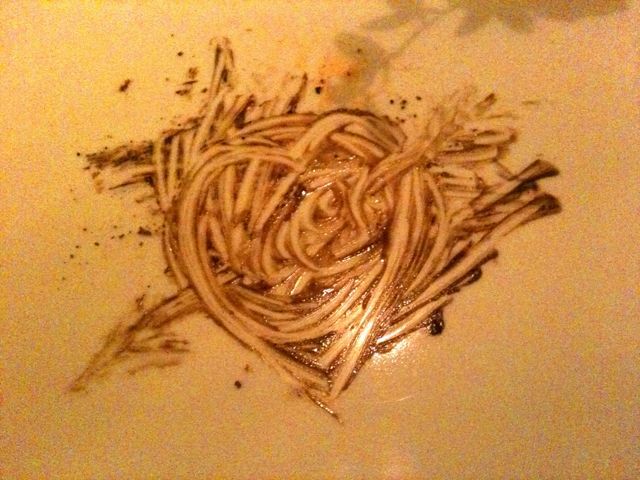 It was the culmination of a series of small, amazing plates that had been like, would be like, our Maine trip every year. A journey. That culmination, of course, wasn’t about the destination. It was about everything we did along the way, and that exclamation point just reminded us that it’s all about the discovery. Of our past ghosts, our present tense, our future itineraries.